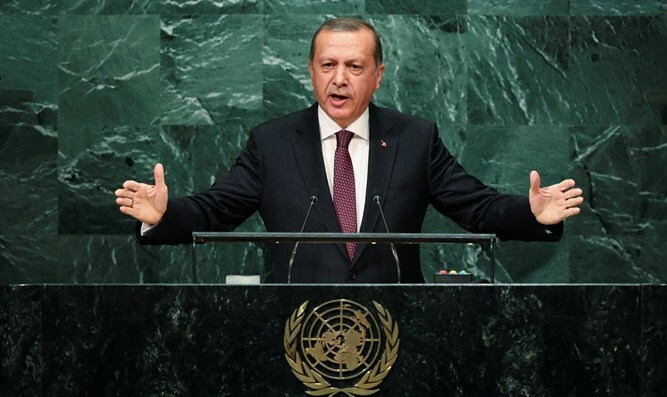 Turkish President discusses Turkey-Israel relations with Jewish-American leaders in New York. Turkish President Recep Tayyip Erdogan on Thursday discussed Turkey-Israel relations in a meeting with Jewish-American leaders in New York on the sidelines of the United Nations General Assembly, the website of the Turkish newspaper Daily Sabah reported. According to the report, Erdogan highlighted that the normalization of relations between Turkey and Israel is important to find solutions to economic and humanitarian problems experienced by Palestinian Arabs and told them about Turkey's ongoing humanitarian aid efforts for Gaza. Erdogan also told the Jewish leaders that a “two-state solution” and a state of Palestine with eastern Jerusalem as its capital was necessary to resolve the conflict in the region. A number of prominent Jewish leaders attended the meeting, according to Daily Sabah, including Executive Vice Chairman of the Conference of Presidents of Major American Jewish Organizations Malcolm Hoenlein, American Israel Public Affairs Committee (AIPAC) President Robert Cohen, CEO and National Director of the Anti-Defamation League (ADL) Jonathan Greenblatt. Erdogan recently signed the reconciliation agreement between his country and Israel into law. Under the deal, Israel will pay Turkey $20 million in compensation for the deaths of 10 pro-Hamas Turkish assailants who attacked Israeli soldiers during a raid on the Gaza-bound Mavi Marmara ship in 2010. The agreement also provides for normalization of relations, the removal of sanctions the countries have imposed on one another, an increase in the level of diplomatic relations and an exchange of ambassadors. Turkey’s Foreign Minister, Mevlut Cavusoglu, recently indicated that Turkey and Israel would begin the process of swapping ambassadors "in the coming days". Erdogan earlier this week spoke at the UN General Assembly where he said his country would like to use the reconciliation agreement with Israel to bring about peace between Israel and the Palestinian Authority (PA).